Gunnison River Basin High/Low graph June 1, 2016 via the NRCS. Snowpack across the Gunnison River Basin is below normal, particularly in the East River Basin where the predicted streamflow for the April through July runoff season is 78 percent of normal. Spring runoff for the East River is likely to peak within the next few days. “The long-term average peak occurs on June 11, so this year’s peak seems to be on track or a few days earlier than normal,” Kugel said. Reservoir conditions look to be quite different from last year. Last June, both the Taylor Park and Blue Mesa Reservoirs came within inches of spilling over. This coming summer, Taylor Park Reservoir is projected to reach somewhere between 90 percent and 95 percent of full and Blue Mesa is projected to reach 83 percent of capacity. Kugel attributes the difference to a slightly better snowpack in the Taylor Park area and a recent 10-day peak flow release from Blue Mesa in accordance with a record of decision for the Aspinall Environmental Impact Study. Water was released for the lower Gunnison River for endangered fish habitat. “Blue Mesa should start filling again but dropped several thousand acre-feet during the release and is currently at 69 percent of capacity,” Kugel said. The Taylor Park Reservoir is currently at 72 percent of capacity and is in the midst of its peak release of 450 cubic feet per second (cfs), which started Tuesday, May 31 and runs through Saturday, June 4. “We do that both to satisfy privately held instream flow rights on the Taylor River and to help flush sediments from the streambed and improve the fishery on the Taylor River. Once the release is complete, it will be stepped back down to 300 cfs over the course of a few days and it should remain at that for the month of June,” Kugel said. That will make for good flows for several June events featuring local waterways. This year’s Gunnison River Festival, which features the annual river float and fish fry as well as events at the Whitewater Park, will take place just after the 41st annual Colorado Water Workshop. Originally started by local historian Duane Vandenbusche and Gunnison water lawyer Richard Bratton, this year’s workshop features several authors, including Western Slope writer Craig Childs. The Colorado Foundation for Water Education will also host a two-day tour of the Gunnison River Basin, providing an in-depth look at everything from Blue Mesa Reservoir to local irrigation practices and infrastructure to an organic farm and the Gunnison Whitewater Park. The tour runs June 21-22; the Colorado Water Workshop runs June 22-24; and the Gunnison River Festival runs June 24-26. The Upper Gunnison River Water Conservancy District has been busy developing a plan for future water use in the Gunnison Valley and, at the same time, watching other basins in the state to see where they expect their water to come from. However, as the process of developing a statewide water plan starts to unfold, UGRWCD manager Frank Kugel said the conversation seems to be steering clear of the dreaded talk about trans-mountain diversion. “Everyone acknowledged the 800-pound gorilla in the room—trans-mountain diversions,” Kugel said. Basin representatives from around the state got together for a meeting hosted by the Colorado Water Congress in Denver on December 12. It was the first meeting of many to come related to the Colorado Water Plan and, more specifically, the Basin Implementation plans, which will be incorporated into the state plan over the next year. To help in developing its own Basin Implementation Plan (BIP), Kugel said, the UGRWCD hired Wilson Water Group as a consultant and has Greg Johnson helping them. He worked with the Colorado Water Conservation Board until July of this year. Having a plan that is written with an awareness of what other basins are doing could also help keep lines of communication open between the UGWRCD and other basins throughout the development of the Colorado Water Plan. Basin Implementation Plans will be presented to the Colorado Water Conservation Board on July 14. Although water is probably more essential to his livelihood than many of us in the Gunnison Basin, Trampe admits that his philosophy on keeping water in the Gunnison Basin has changed over the years. When Arapahoe County proposed the Union Park project, Trampe recalls that the local sentiment was “not one drop” and no one dared stray from that strict line in the sand. Today, Trampe thinks that Western Slope interests are “better off at the table than on the menu” when it comes to talking to the Front Range and others about West Slope water. Trampe’s philosophy is tied to real life experience: He has spent the last seven years negotiating with the Front Range to develop the Colorado River Water Cooperative Agreement. Perhaps characteristic of a rancher’s outlook, Trampe is both hopeful and frustrated when it comes to resolving Colorado’s water disputes. 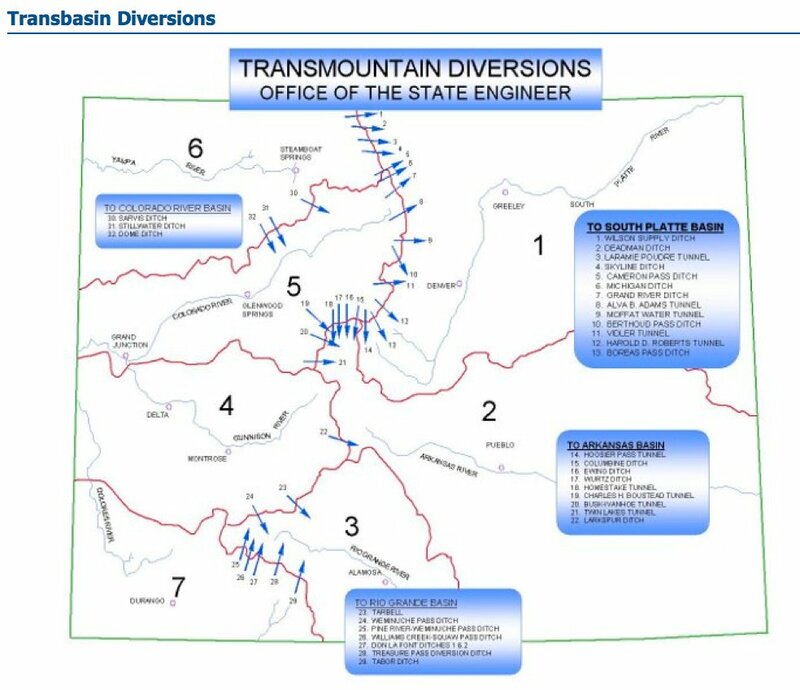 He believes, as many do, that big, transmountain water projects simply won’t be able to provide enough firm yield to satisfy Front Range interests. In statewide water planning discussions, Trampe has been a proponent of addressing this problem through risk management — the idea that the state must have a comprehensive way to evaluate and guard against the potential consequences of failing to meet water delivery obligations to downstream states as it considers new diversions out of the Colorado River Basin. The Bureau of Reclamation has a number of other storage projects in the basin, in addition to the Aspinall Unit reservoirs, including Taylor Park on the Taylor River, Ridgway on the Uncompahgre River, Silver Jack on the Cimarron River, Crawford on the Smith Fork of the Gunnison, fruit growers on Current Creek and Paonia on Muddy Creek, tributary to the North Fork of the Gunnison River. 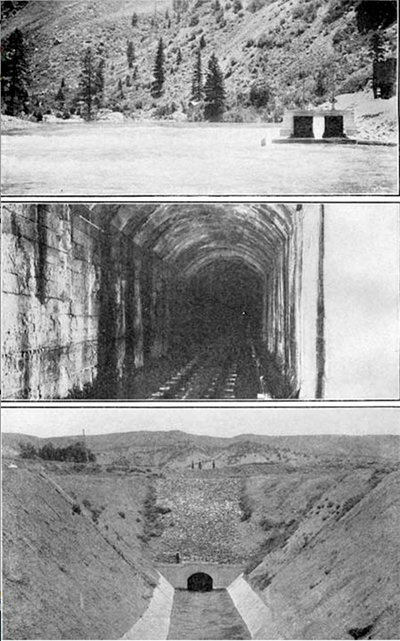 One of the first projects developed by the Bureau of Reclamation was the Uncompahgre Project, which provides irrigation water for a variety of crops in the Uncompahgre Valley between Colona and Delta. 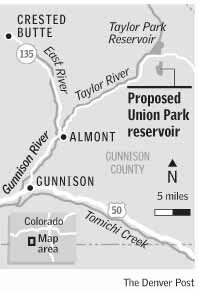 A key component of the project is the Gunnison Tunnel, a 5.7 mile long tunnel that diverts water from the Black Canyon of the Gunnison and discharges it into a series of canals in the Uncompahgre Valley. The tunnel has a 1913 water right for 1300 cfs and supplies some 60% of the irrigation water for the 76,000 acres under the project. Taylor Park Dam was constructed in 1937 to provide supplemental irrigation for the Uncompahgre Valley. Taylor Park Reservoir has a capacity of 106,230 acre feet. The 1975 Taylor Park Exchange Agreement allows for transfer of storage downstream to Blue Mesa Reservoir to provide the Gunnison Tunnel with a more readily available source of irrigation water. An additional benefit of this exchange was the flexibility to make releases in time and amount that would benefit recreational and agricultural users in the Upper Gunnison basin. In spite of early concerns that funding for cloud seeding might dry up, Gunnison County entered into an operational agreement with North American Weather Consultants for the 2011-2012 winter season on November 15. With the total bill projected at $95,000, a 3.26 percent increase over last year, the Upper Gunnison River Water Conservancy District came through with a $26,500 contribution. The county will contribute $10,000 and Mt. 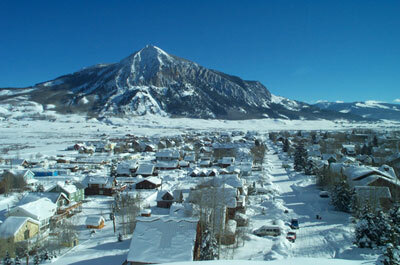 Crested Butte budgeted $3,000. The Colorado Water Conservation Board will cover $47,500 in matching funds, and the remaining moneys will be collected from a variety of local contributors. 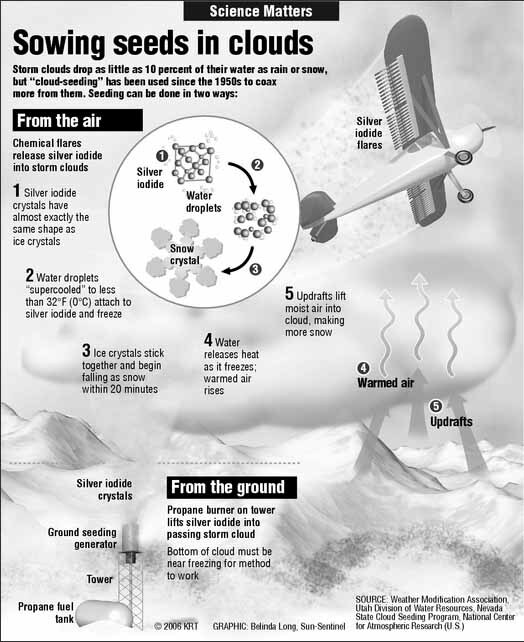 More cloud-seeding coverage here and here. 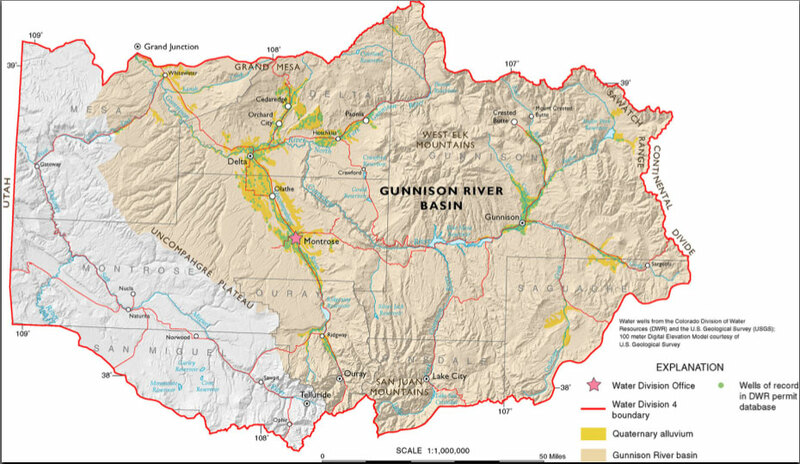 As the runoff continues to subside, Reclamation believes it is necessary to further reduce flows in the Gunnison River below the Aspinall Unit. The Colorado Basin River Forecast Center is showing inflow to Blue Mesa continuing to drop from the current level of around 5,000 cfs to 2,100 cfs by mid July. The Uncompahgre Valley Water Users, who had reduced diversions through the Gunnison Tunnel a week ago because the Uncompahgre River was filling their needs, are now in need of filling the Tunnel. To facilitate the filling of Blue Mesa Reservoir, Reclamation will not be matching their increased diversions, which will take place starting on Thursday, June 30th, with increased releases from the Aspinall Unit. This will result in a flow reduction in the Gunnison River of approximately 200 cfs bringing flows in the Canyon and Gorge to around 1,100 cfs as measured at the gage below the Gunnison Tunnel. We know this is inconsistent with information previously provided, but hydrologic conditions are constantly changing and we must react to current circumstances and forecasts.